Growing your own food has its benefits. Feeding your family from your own garden not only ensures that you have a steady supply of fresh-grown food for your family but also improves the quality of the city, improves air quality, and reduces pollution. It can also address hunger issues and obesity problems around the world. When you eat fresh fruits and vegetables from your own roof garden, indoor garden, backyard garden or vertical tower gardens, you can easily feed your family. If you want to take it a step further, you could even produce enough food to supply to your local market and generate a steady income. Indoor gardens and aquaponic systems are easy to setup at home, and they don’t need a whole lot of space for producing fresh home-grown food. There are ways you can grow herbs and vegetables and raise fish at the same time in your own home, in your basement, living room, kitchen, or anywhere, where you have some additional space, and setup your indoor vertical garden. 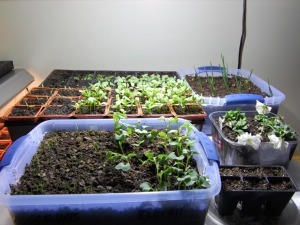 Designing your small backyard vegetable garden or indoor garden isn’t that difficult. You can grow a variety of herbs and vegetables in flower pots or small containers and keep them anywhere you like. 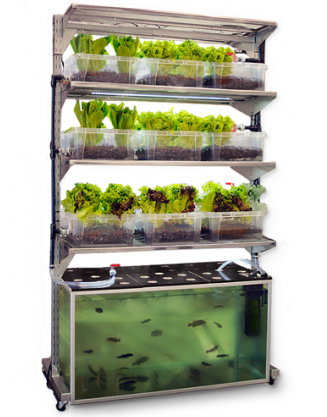 A vertical soilless aquaponic system is easier than a soil based system and can be used all year round to grow herbs and vegetables. 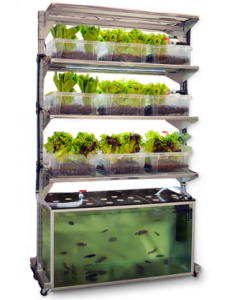 A vertical tower can also have fish in a fish tank with a re-circulation aquaponic system, that uses waste from the fish to feed the plants and so, it reduces the need for additional fertilizers for the plants. You can have this system indoors or outdoors and reduce the need for pesticides to control soil borne insects. You can use all natural organic methods for growing your crops. Because it’s a soilless system, there is no weeding, tilling and no need to get dirty. A vertical garden can fit almost anywhere in your home and looks gorgeous anywhere, whether you decide to put it in your kitchen, living room, or bedroom. A tower garden grows crop quicker than regular soil based gardening and uses less resources. It’s also easier than soil based gardening to maintain. With the demand for food increasing around the globe, human agriculture is having a huge impact on natural resources. It is also causing greenhouse emissions and habitat losses for wild animals. 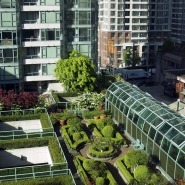 Roof gardening can increase greenery in cities significantly. As we know, there are many benefits of having plants in cities. Some of the benefits of plants are supply of food, control of carbon emission, supply of oxygen and filtering out harmful carbon dioxide from the atmosphere. With green roofs, water is stored by the substrate or the drainage systems of the building and then taken up by the plants from where it is returned to the atmosphere. This tends to utilize water more efficiently and also keeps the air cool through evaporation. Therefore, growing more plants in cities not only makes the surrounding beautiful, but growing plants wherever possible may also help to reduce unpleasant city heat and pollution that is often associated with urban living – the concrete, paved roads and smoke from automobile emission and industries of the urban areas that add to greenhouse effects. Plants are essential for improving the air quality and adding more oxygen to the atmosphere; they act as natural filters. When you grow your own food, you are also saving on trips to the grocery store, which means less carbon and greenhouse gas emissions. 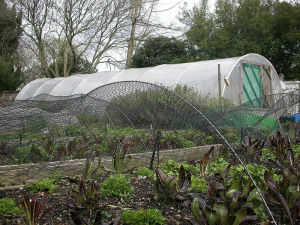 Urban farming also makes food as local as possible. Most people don’t realize that when they buy food at the grocery store, it has to travel hundreds of miles, 1,500 miles on average, before it can reach your table. Growing and buying local food will eliminate all the energy wastage and carbon emissions associated with packaging, transporting, and storing food. When you grow your own food in your backyard kitchen garden, your roof garden or in vertical towers, you are able to use your kitchen waste as fertilizers. By doing so, you are able to utilize resources more efficiently. You are minimizing food waste and also saving valuable landfill space. The popularity of growing food with alternative methods, such as using a tower garden, a roof garden or using indoor pots for growing herbs and vegetables, is growing in popularity. Apart from making our homes beautiful, plants also supply us with many added benefits. Eating fresh and good nutritious food has many health benefits and it also reduces pollution and filters out greenhouse gasses form the atmosphere. With increasing demand for food around the world, growing your own food can ease some of the pressure from global agriculture. When it comes to grocery shopping, growing your food gets you as close to being local as possible. You may be able to save on groceries, energy and reduce pollution, all from your home-based garden. If you grow your garden at a larger scale, you may even be able to generate a steady source of income right form your home. For more information on Urban Farming or home based gardening, please leave a comment below, or Click here to book a meeting with us. Hey Lou! I don’t take call in orders. My mernhact account is for dog boarding and we take Pay Pal for plants. It is 100% secure, however I understand if you’re uncomfortable with this. Just send in a check to the farm: Dancing Creek Farm, 244 West Fork Rd, Cascade, VA 24069 Make check to Dancing Creek Farm. I’ll ship it next week if you email your address or just send it to me on Face Book.